A renewed debate on the possible partition of Iraq is emerging. Let’s get one thing out of the way. As for letting a civil war rage, deliberately, I don’t understand. Everyone is (rightly) complaining about world inaction on the genocide in the Sudan. But here you want to provoke a genocide (maybe a million dead and 5 million displaced) and have troops in the region and not intervene? Doesn’t that make you worse than Khartoum? It is despicable. And, remember that such a war a) would not stay inside Iraq–it would become regional; and b) a full-scale war in the Persian Gulf region will lead to a big increase in your gasoline prices (as in, you ain’t seen nuttin’ yet). Personally, I am against breaking up Iraq. I don’t think it is more unworkable than Nigeria or Lebanon. And, the consequences are unforeseeable and potentially very, very dangerous. I do, however, believe that the tendencies toward separatism must be recognized and managed. I say that we make 5 superprovinces: Deep South, Middle Euphrates, Baghdad, Sunnistan, and Kurdistan, along with two smaller ethnic enclaves, of Turkomanistan and Chaldeanistan in the north. Bear with me. The Kurdistan Regional confederacy has already said that it will never disband its peshmerga militia, some 60,000 strong, and will never allow Federal troops on its soil. It is handing out visas and inviting in oil prospectors without asking Baghdad. There is real danger of secession. But the Kurdistan confederacy (the green in the north) has something that it wants from Iraq, and which other Iraqis want, which is the oil-rich Kirkuk (old name: Ta’mim) province. Kurdistan is waging a demographic war, via flooding Kirkuk with Kurdish immigrants and squatters (only some of whom used to live there), in its bid to annex oil-rich Kirkuk province to the Kurdistan Region (which now comprises Irbil, Dohuk and Sulaymaniyah). They want to hold a referendum on bringing the whole province into the Kurdistan confederacy in December 2007. They will win the referendum. And then the Northern Civil War will begin, because the Turkomans and the Arabs will never accept this outcome. So here is what I would do if I were in charge. Mind you, this is not worked out to detail, but a general set of suggestions. First, I would send the new Iraqi army into Kirkuk immediately to police it instead of having the peshmerga or heavily peshmerga-infiltrated Kirkuk police do it. Kirkuk is dangerous but it is not out of control, and this would be a good training wheel mission for the Iraqi army, supported by US forces from a distance. The neutrality of Kirkuk security forces has to be affirmed to begin with. The Arab stan can hook up with largely Arab Ninevah province which will be part of Sunnistan, so that the Sunni Arabs would share in the special petroleum dividend, and that would help combat the insurgency. Likewise the small Turkoman and Chaldean stans might stretch across what is now Kirkuk and Ninevah/Mosul. They’ll be on their own. Kirkuk city would be a shared city, maybe for some of them a shared capital, on the model of Chandigarh in India (which is a multiple provincial capital). The Coalition should dictate an oil profit sharing agreement before they go. Of Kirkuk’s petroleum profits, the central government gets 33 percent. The Kurdistan regional confederacy gets 33% if it stays in Iraq. If Kurdistan secedes, it gets nothing. The oil belongs to Iraq. This principle should be guaranteed by the Coalition. Some formula would have to be worked out for apportioning the 33% among Turkomans, Chaldeans and Sunnistan. Sunnistan is much bigger but will have other sources of income. Whatever you do, they will scream, but that is what the new Iraqi army is there for. Send some of those Hungarian tanks with it. Besides, any percentage of the profits on 800,000 barrels a day is a hell of a lot better than the bupkes they have now. And, they’ll share in some of the 33% that goes to the federal government, too, since that will be parcelled back out to provinces in services and programs. A danger of ethnic stans is that they might want to secede. But I say that if they do, then their share of Kirkuk oil is cut off. So they can be rich Iraqis or poor stans. Their choice. So that would be an incentive for the Kurds to remain at least nominally in Iraq, and to have good relations with Baghdad and with Turkoman, Chaldean and Arab neighbors. (Ethnic attacks would hold up oil payments). Partitioning Kirkuk province up front precludes it from blowing up into ethnic strife. And here’s the rest. The Rumaila oil field income is also split up. 20% goes to the federal government. 20% goes to Deep South Provincial Confederacy. 20% goes to Middle Euphrates Provincial Confederacy. 20% goes to Baghdad Province. And 20% goes to Sunni Arab Confederacy. You will say, the Sunni Arab Confederacy is double dipping, getting shares from both Kirkuk and Rumaila. And I will say, bingo! They can go on blowing things up, or they can be Kuwaitis. Their choice. You will say, how can the federal government live on these percentages of the oil money? I will say that it isn’t good for the federal government to hog the oil income–it makes it too powerful and reinforces dictatorial tendencies. And I will say, if it needs money, it should put in an income tax like every other government. Finally, the amount of petroleum profit sharing is not absolute. It assumes good behavior. 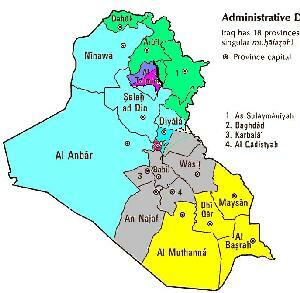 Baghdad could make reductions for too many militias in a province, for instance. Bad behavior would be punished. So that’s my plan for keeping Iraq together as a federal state with substantial provincial sharing of oil income. I say, instead of just doing ad hoc policy and waiting for the blow-up, as Bush keeps doing, lets spend what political capital we have and make some forward-looking settlements right now. But lets make settlements that might produce social peace, not ones that lead to genocide and further inter-statelet wars.